Yesterday we wrote about Apple's iPad running into trouble with a company called STMicroelectronics which has a technology trademarked as "IPAD". Today, it has emerged that another company, Fujitsu, is claiming that the trademark "iPad" belongs to them. 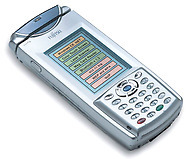 Fujitsu says that they applied for the iPad trademark in 2003. Fujitsu's iPad is a mobile device, sold mainly in the USA, whic helps shop clerks verify prices, check real-time inventory data and close sales on the go. It has a 3.5 inch color touchscreen, an Intel processor and runs on Microsoft's CE.NET operating system. The device also has Wi-fi and Bluetooth connectivity and supports VoIP. It’s our understanding that the name is ours. Mobile is a keyword for Fujitsu’s iPad, too. With the iPad, workers don’t have to keep running back to a computer. They have everything right at their fingertips. Yamane also mentioned that Fujitsu is consulting lawyers over the next steps to be taken in this matter.